Restored by UCLA Film & Television Archive in association with the Film Foundation. Restoration funding provided by The Film Foundation. Newly re-mastered in HD by Olive Films and Ignite Films. One of the greatest film noirs of all time, wonderfully written by Philip Yordan (Panic in the Streets), beautifully shot by John Alton (He Walked by Night) and stylishly directed by Joseph H. Lewis (Gun Crazy) with a rousing score by David Raksin (Suddenly). Raw and violent, steeped in the film noir tradition; this cult classic ventures into the seamy gangster underworld, oozing with seediness and low-life characters. Far ahead of its time, The Big Combo takes a dark, disturbing look at the battle between Police Lieutenant Diamond (Cornel Wilde), a good and honest cop, Mr. Brown (Richard Conte), a sadistic crime boss and Susan Lowell (Jean Wallace), a cool and beautiful blonde who gets caught in the middle. With the help of the gangster's ex-girlfriend, Diamond is determined to bring down the cunning gangland kingpin. But the gangster and his henchmen are ruthless. They savagely pummel Diamond and conduct gut-wrenchingly brutal acts of torture that were unusual on screen at the time of the film's release 1955. With its unflinching direction by Lewis, The Big Combo was a worthy predecessor of later explicitly violent films that honestly explored unsavory worlds. The Stellar cast includes Brian Donlevy, Lee Van Cleef, Earl Holliman, Robert Middleton, Jay Adler, John Hoyt, Ted de Corsia and Whit Bissell. 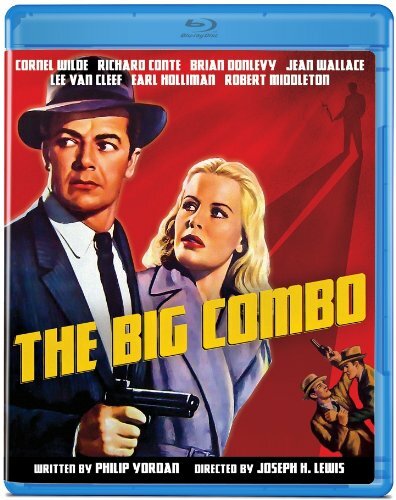 A prime example of the American film noir style that flourished during the 1940s and '50s, The Big Combo is now highly regarded as a stylistic milestone for its innovative use of deep shadows and harsh, singular light sources to define its visual strategy. This look is largely credited to the rule-breaking brilliance of cinematographer John Alton, who turns a standard plot of the era into a richly atmospheric experiment in visual invention. Ignoring conventional approaches to lighting, Alton defines the screen in terms of blackness, often framing characters as silhouettes cast in ominous grays or thick, roiling fogs. Moving from clarity to abstraction with masterful grades in between, Alton's trend-setting style has been celebrated by cinematographers since the film's release in 1955.